Smithfield, Illinois is where the studio of artist and muralist Harold Kee Welch is located. The studio and museum is located in the old telephone building which was originally a bank. 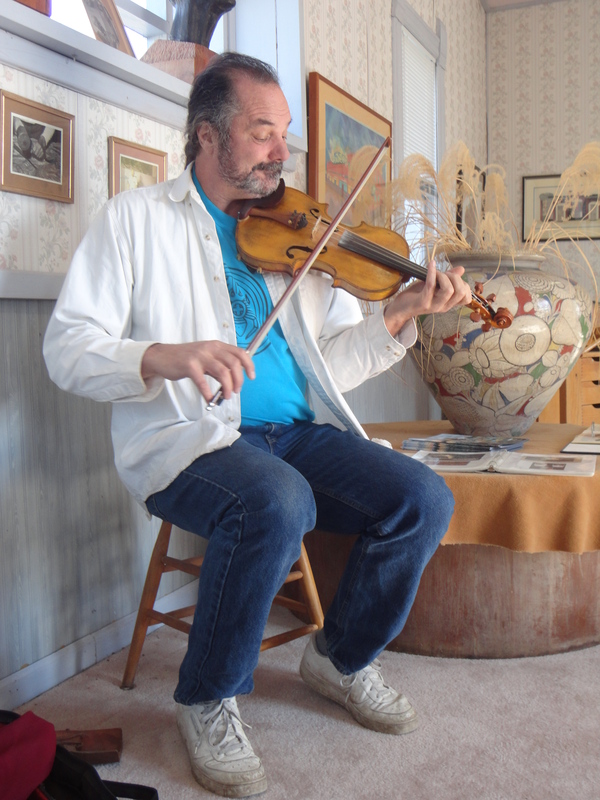 During the Spoon River Drive, Welch’s studio was open and his son Franklin “Chico” Welch played his violin entertaining guests as they looked at Welch’s artwork. Like a pied piper, his melody drew visitors into the studio to be wowed with the art that was created decades ago. Born in Smithfield, Welch has created hundreds of paintings, carvings, murals and sculptures that are in private collections all over the country. His 16’ x 80’ mural depicting the life of Abraham Lincoln and Illinois that was originally commissioned by the first National Bank of Springfield is currently being considered for reinstallation at various places. For information about those watercolors, call 309-783-3121. Lucky you, he is so talented! No I don’t have any idea on the value, but it must be wonderful to own such wonderful art. No, I don’t know the values, just love his art.